*** WINNERS *** These Five Lucky Gals Are All Living the Life of Riley! CONGRATS! « Hey There! Meet Me on Facebook During Week 2 of October’s Tuesday Facebook Follow! I want to give a big and hearty CONGRATULATIONS to Danetta, the winner of the Huge Family Board Game Prize Pack from FamilyandPartyGames.com! Danetta now has 48 hours to confirm! I also want to give a big and hearty CONGRATULATIONS to Jessica, the winner of the Magnetic AlphaBoard from Educational Insights! Jessica now has 48 hours to confirm! I also want to give a big and hearty CONGRATULATIONS to Amanda, the winner of the Phonics Firefly from Educational Insights! Amanda now has 48 hours to confirm! I also want to give a big and hearty CONGRATULATIONS to Heather, the winner of the Rock 'n' Rolla 2-in-1 Rocker and Ride-On Toy from Diggin Active! Heather now has 48 hours to confirm! I also want to give a big and hearty CONGRATULATIONS to Lori, the winner of the Bialetti Trends 5 Qt. Pasta Pot! Lori now has 48 hours to confirm! 2 Responses to *** WINNERS *** These Five Lucky Gals Are All Living the Life of Riley! CONGRATS! 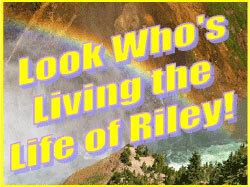 Congratulations to the winners of living the life of Riley! Maybe next time i can catch up too. YAY! So happy to have won! I have replied to your email. *** WINNERS *** Holly, Michael and Allen are Living the Life of Riley! CONGRATULATIONS!